Emoji design is one small area that a company can inject personality into otherwise similar-looking operating systems. I recently got my hands on a Fitbit Versa, and enjoyed taking a look at the custom headband-sporting emojis on the device. Emojis with headbands include everything from 😀 Grinning Face to 🤗 Hugging Face; even 👻 Ghost and 🤠 Cowboy Hat Face feature headbands if you look closely enough. 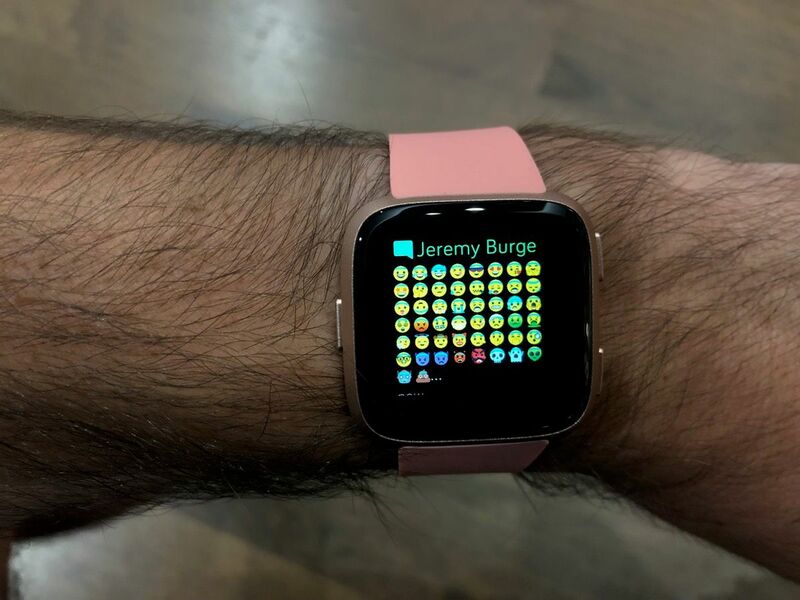 Above: Fitbit Versa showing a selection of regular emojis, displayed with Fitbit's custom emoji font. Photo: Jeremy Burge. To be clear, these aren't emoji-like stickers or some other custom emoticon system. Fitbit has created an emoji font which it uses to display regular Unicode emoji code points with a sportier alternative. The way this is implemented is no different to how Samsung devices show different emoji designs to those on an iPhone running iOS. Where Apple chooses to display the generic 📱 Mobile Phone emoji as an iPhone and Samsung displays the same emoji as a Galaxy; Fitbit chooses to display the 👽 Alien as an alien that's also interested in fitness. 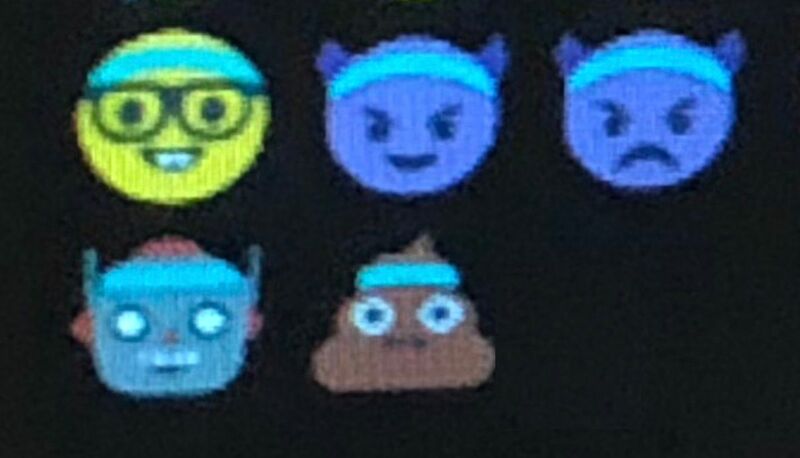 Above: Robot and Pile of Poo get headbands the Fitbit emoji font. There doesn't seem to be a way to input emojis into the Fitbit touch-screen interface, so the best way to see these emojis is in notifications from mobile apps such as iMessage, WhatsApp and Telegram. Support extends past the smileys section, with the Robot, Pile of Poo, and even fantasy characters such as Zombies and Elves getting the headband treatment. Above: Even the fantasy characters get a sporty makeover in Fitbit's emoji font. Support for gender sequences is lacking, as seen by the gender signs after each emoji. Photo: Jeremy Burge. The majority of animals, food, activities, travel, objects and symbols fall back to open-source Twemoji designs when Fitbit hasn't provided a custom image. Among the sports, the running shirt and snowboarder both have turquoise-colored garments which is used as part of Fitbit's branding. Some technical limitations in this implementation include text-parsing issues. Most notably, when it comes to gender and skin-tone sequences: the skin tones are mostly not shown, and the gendered characters display as the base emoji first, followed by a gender symbol. Additionally, this set is limited to Emoji 5.0 from 2017; so no support is included for 2018 additions such as 🥵 Hot Face and 🥶 Cold Face. Collectively, this emoji set does a formidable job of conveying the same concept as the emojis on other platforms, yet with a playful nod toward the device they are being displayed on. I'd love to see this font expand to include animals with headbands in future, or for the watch emoji to match one of the Fitbit models (this currently shows the generic Twemoji watch). Should this set be maintained and updated by the company, it's a welcome expansion of the emoji universe. These emojis are available now on the Fitbit Versa and Fitbit Ionic. Note: At this stage Fitbit emoji designs are not listed in the Emojipedia archive. Maybe one day? New changes on Twitter mean that for the first time each emoji counts as the same number of characters in a tweet. Previously 💁, 💁🏽, and 💁🏽‍♂️ would have used 2, 4, and 9 characters respectively.